After several years of planning and renovation Levenshulme Inspire centre opened it's doors to the general public. http://www.lev-inspire.org.uk/blog/ and amongst the V.I.P's which included Sir Gerald Kaufman, and Sir Richard Leese, Myles and Connor Ryan - part of the Connected who narrowly missed winning this years Britain's Got Talent and myself. In truth it was hard to compete with the twins, who were real celebrities, whereas The HPM hasn't quite got to the stage where scores of screaming girls are clamouring for a signed photo. 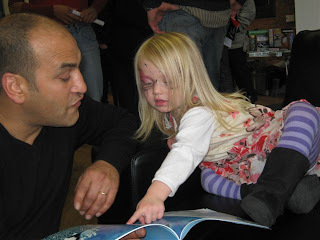 Nevertheless, I battled through the noise of the Face Painting table next to me and the art and craft table further along to read a couple of stories. I did manage to hold the attention of the audience for a while, but after a few stories it seemed that the lure of make-up was too much for the audience and one by one they slowly disappeared. Thankfully, Karen the event organiser arranged for another reading at the front of the centre which captured a more attentive audience and once again the Hairy Plug Monster was a huge success with more than a few parents taking a signed copy home with them. But before I go here's a little poem I wrote with Maya-Rose. Everyone should read The Hairy Plug Monster to their young children.